Windows and OS X/Linux save files are not compatible. 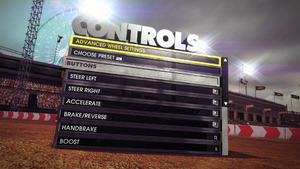 On Windows, see Field of view (FOV). MSAA, CSAA (Nvidia/Windows only), QCSAA (Nvidia/Windows only). This fix only works for the hood/bonnet camera. Extract the contents and run Dirt3FovChange.exe. 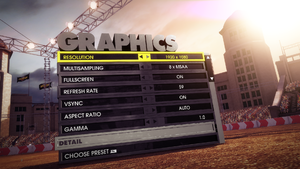 Set the desired vertical FOV. See FOV Calculator for help. Check the boxes for bonnet and bonnet_reverse, and uncheck head-cam. Click Start. Uncheck "Always ask before opening this file" if prompted, then click Run. 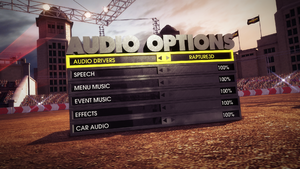 Speech, menu music, event music, effects, car audio. 4.1, 4.2 OS X/Linux only. 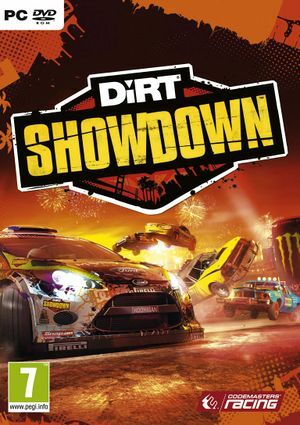 Supported cards: AMD Radeon HD2000 Series, HD3000 Series, HD4000 Series, HD5000 Series, HD6000 Series, HD7000 Series; Nvidia GeForce 8000 Series, 9000 Series, GTX200 Series, GTX400 Series, GTX500 Series. ↑ 1.0 1.1 File/folder structure within this directory reflects the path(s) listed for Windows and/or Steam game data (use Wine regedit to access Windows registry paths). Games with Steam Cloud support may store data in ~/.steam/steam/userdata/<user-id>/201700/ in addition to or instead of this directory. The app ID (201700) may differ in some cases. Treat backslashes as forward slashes. See the glossary page for details.